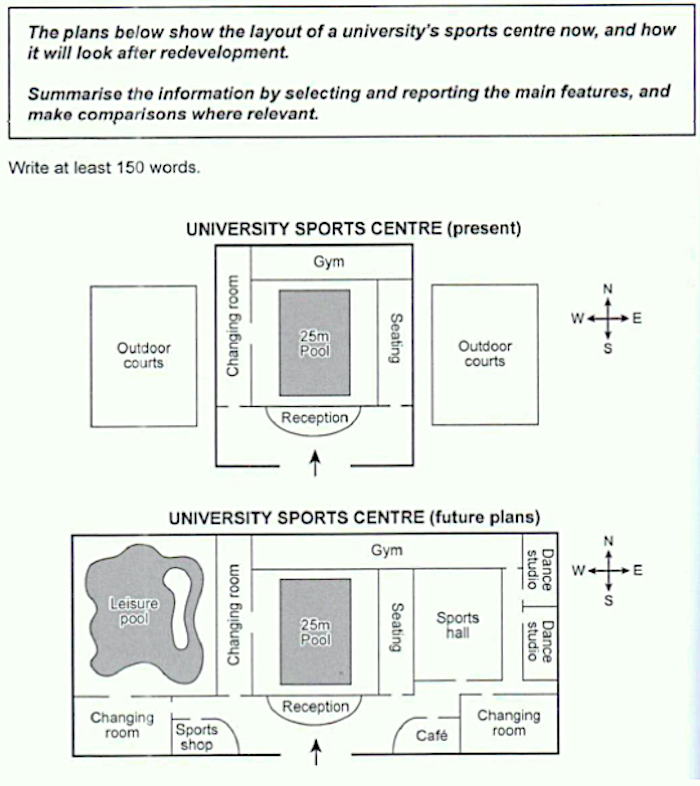 IELTS academic, floor plan /diagram writing task 1. I will need the present tense and the future tense to describe this plan / diagram. I would also recommend organising the information into present (main body 1) and future (main body 2) . Here are some example sentences for describing changes that could be used in a diagram or floor plan like the one in this task. As you can see, some are in the passive voice. There are plans for new facilities such as….. It is essential to include an introduction, an overview and 2 main body paragraphs. Grouping the information is important for a logical report. Word count needs to be 150 words minimum. Aim for around 170 to 180 words for a full response. Never write a conclusion and do not write any opinion. For the overview, pick out the key features and don’t go into details. Writing task 1 carries half the points of writing task 2, however, it is still important to get task 1 right. If you write a strong task 2 and overlook task 1, then you could still end up with a Band 6. Key point: Don’t neglect writing task 1 even though it carries less points, your overall writing has to be good to get a Band 7 or more. So let’s take a look at the task again with a model answer. The plans illustrate the current layout of a university sports complex and proposals for its redevelopment. Overall, the university sports centre is expected to become much bigger with new recreational facilities planned such as dance studios, a leisure pool, shops and a sports hall. At present, behind the reception area, there is a 25 metre indoor pool with a changing room and a seating area on either side, including a gym toward the rear of the building. In addition, there are two separate outdoor courts adjacent to the main building on the east and west side. Regarding future plans, the outdoor courts are set to be removed and the building is planned to be upgraded to a self contained sports facility. The current pool is going to remain as it is, and a large leisure pool with a changing room is expected to be built in the west wing. A proposed sports centre in the east wing will include dance studios and a changing room. There are also proposals for a sports shop and a cafe in the reception area. Any comments? leave them below….